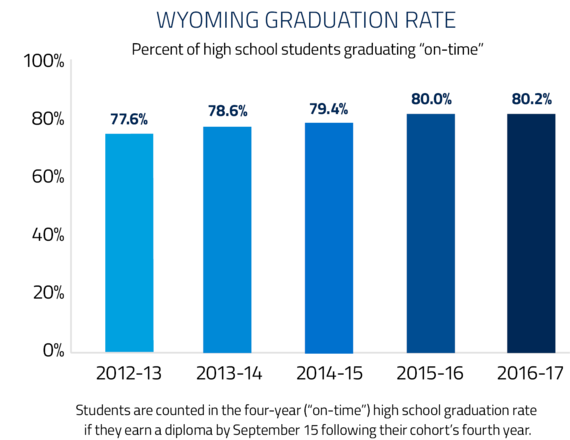 The Wyoming Department of Education (WDE) announced today that high school graduation rates increased slightly to 80.2 percent in 2016-17, which marked four years of improvement from the class of 2013’s 77.6 percent graduation rate. Full graduation rate statistics are available at edu.wyoming.gov/data/graduation-rates/. Since the 2009-10 school year, the WDE has calculated graduation rates using the Federal Four-Year Adjusted Cohort methodology established by the U.S. Department of Education, complying with federal law that requires all states to calculate graduation rates the same way. Students are counted in the four-year (“on-time”) high school graduation rate if they earn a diploma by September 15 following their cohort’s fourth year. Five- and six-year graduation rates are also calculated, and can be viewed with the rest of the graduation rate data.